Making the cast cement legs is not hard, but you will need a lot of bits and pieces and need to prepare a few things to get ready, so I gave the set-up a section all to itself. 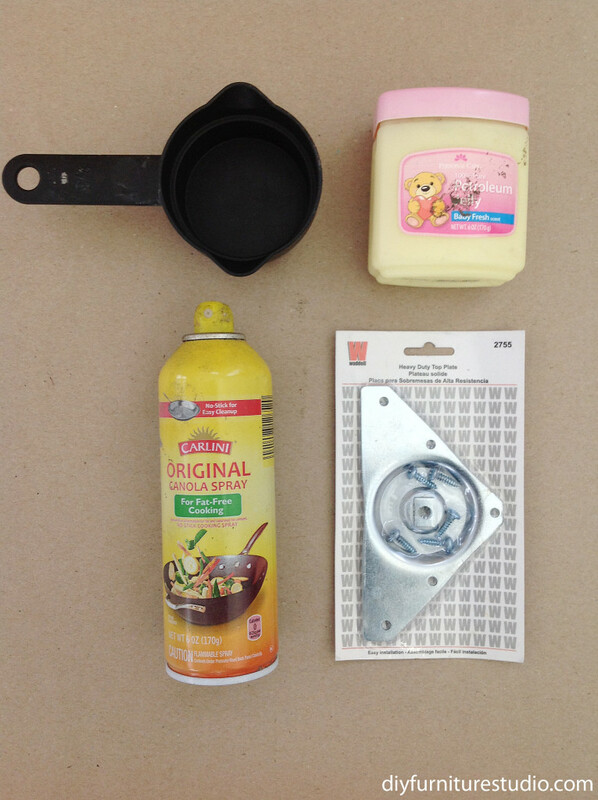 Here are photos of the tools/supplies you will need in making cement sofa legs, just for reference (in no particular order). 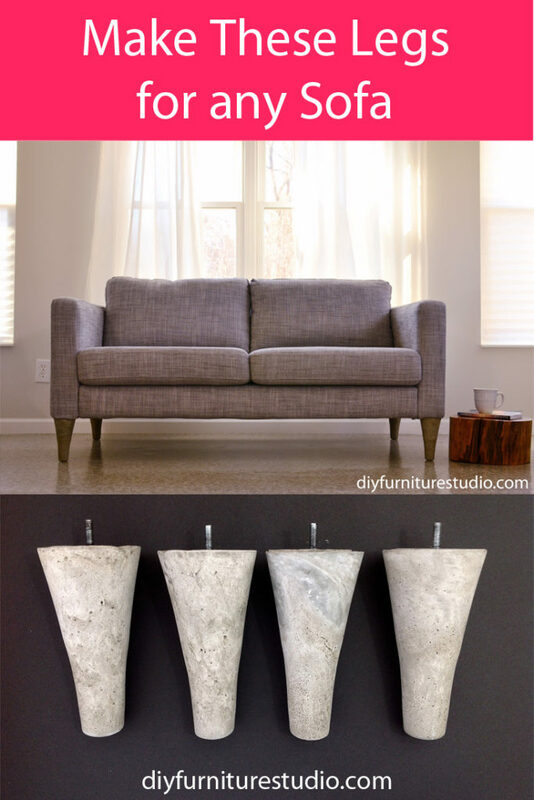 First, choose a mold for your sofa legs. When you are looking for a mold, remember that the inside of the container will be the outside shape and height of your legs. You might be able to reuse your mold for all four legs depending on the shape and contours, but more likely you will need four molds. 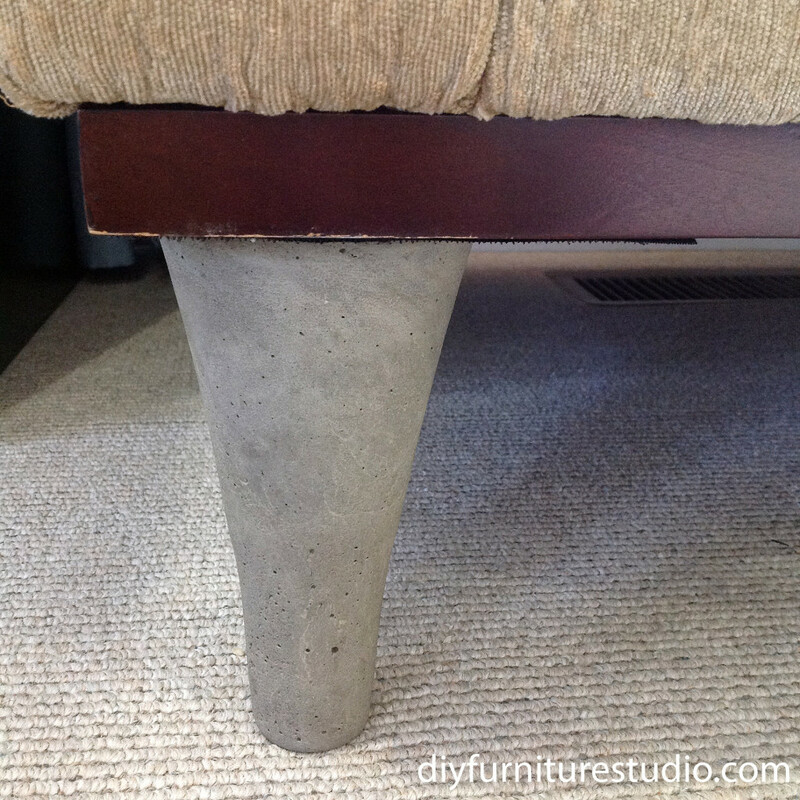 For safety reasons, don’t try to make a cast cement sofa leg that is thinner than about 3 inches (can taper to about 1 inch). I based these suggested dimensions on corresponding wood legs because wood and concrete have similar compressive strength. While I’m thinking about safety, did you read my disclaimers/terms of conditions? 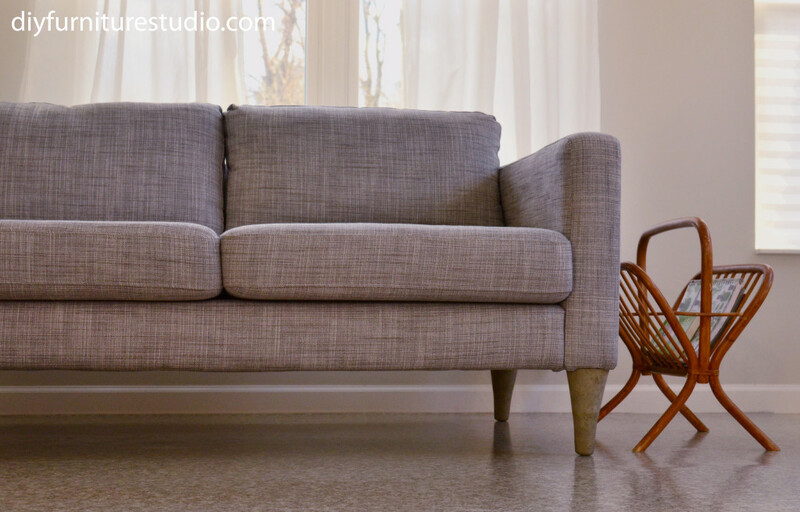 Because keep in mind you are planning to modify a structurally sound sofa with homemade legs which will probably be structurally sound, but may not be. Just consider the safety of what you are doing–that’s all I’m saying. 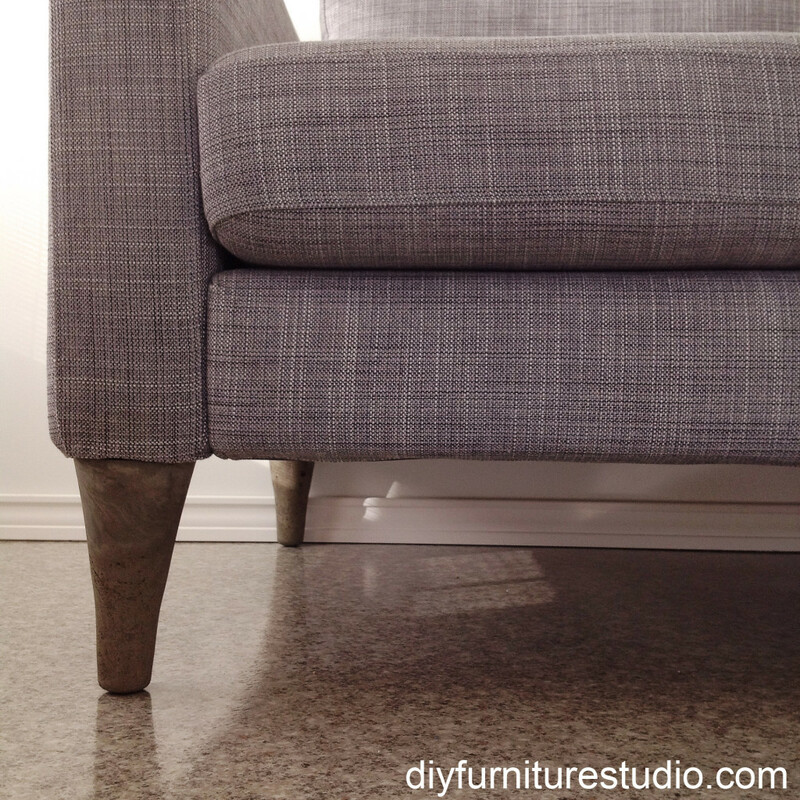 With that being said, we’ve had these cement replacement legs on our sofa for many months with no problems at all, just handsome wonderfulness. 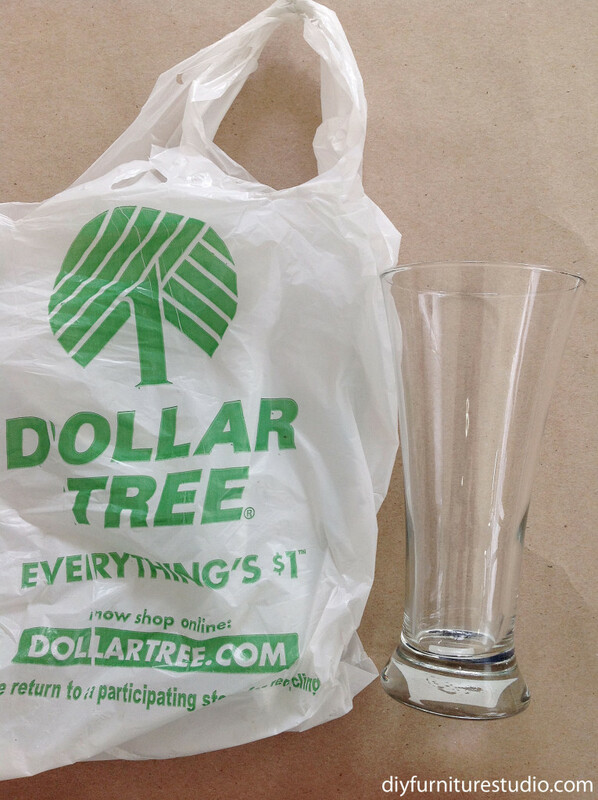 I found drinking glasses that I liked at Dollar Tree for $1 each. 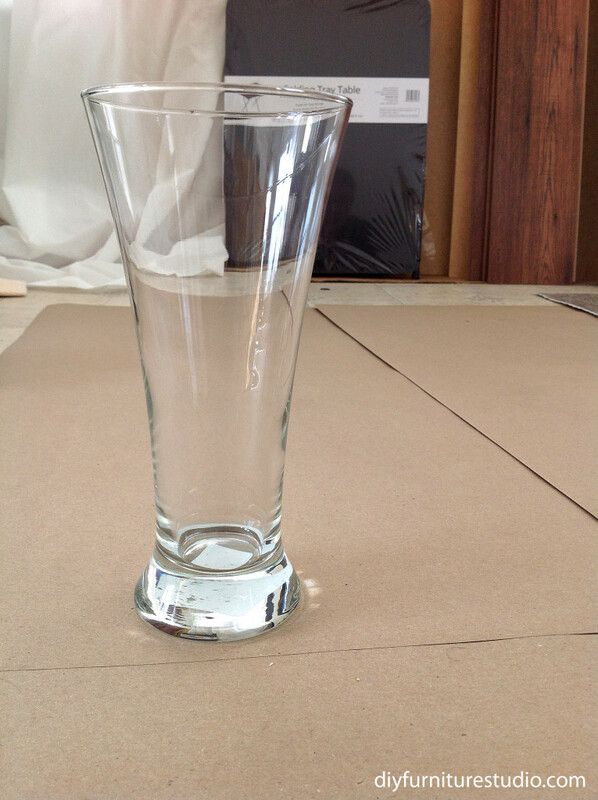 This style of glass had the nice mid-century modern tapered shape that I was looking for. I needed four of these glasses because I had to break them to get the legs out after the cement cured. 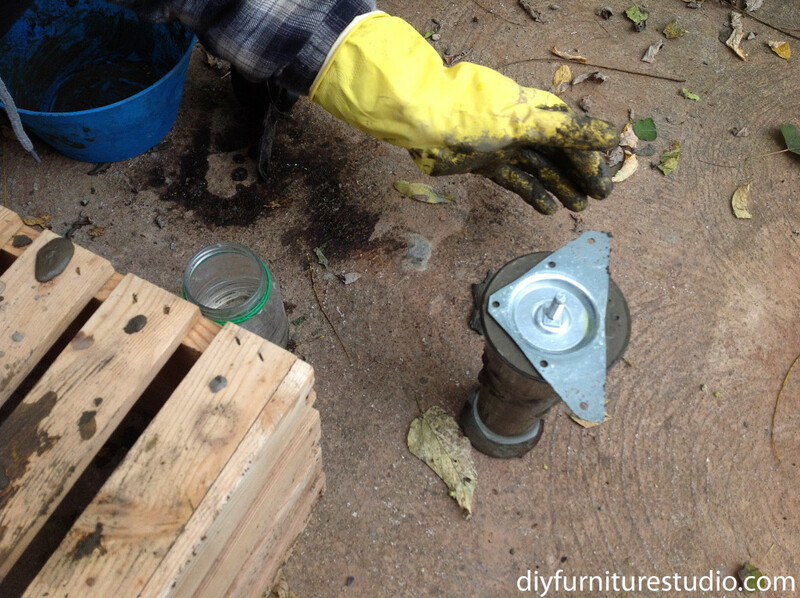 For attaching the cement leg to the sofa, a hanger bolt was cast into the center of the cement of each leg. 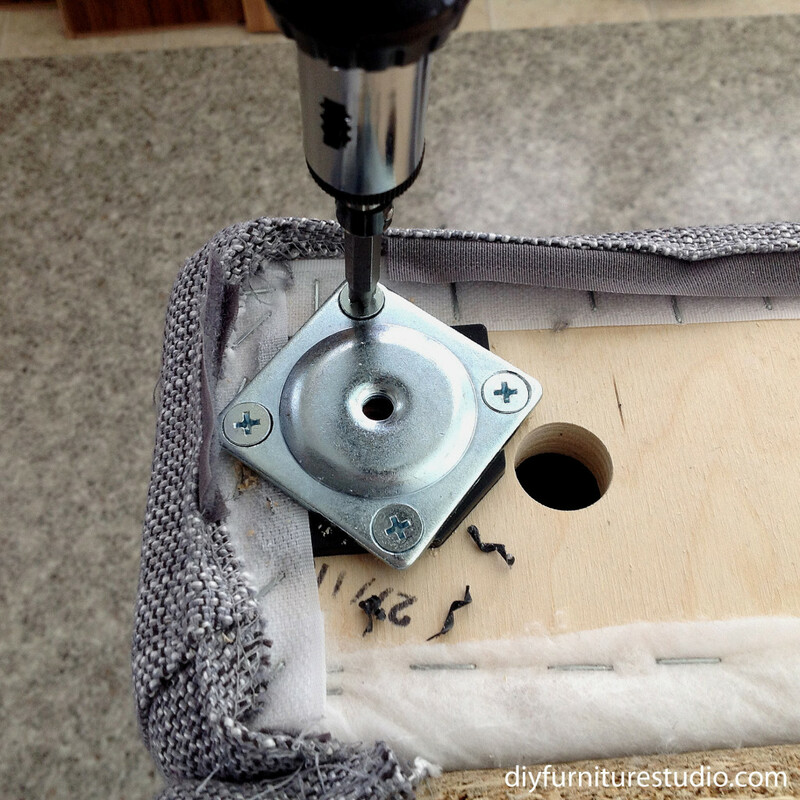 I added nuts and washers (which were glued together first) to the hanger bolts before casting as insurance against the bolt being pulled out of the cement sofa leg during use. 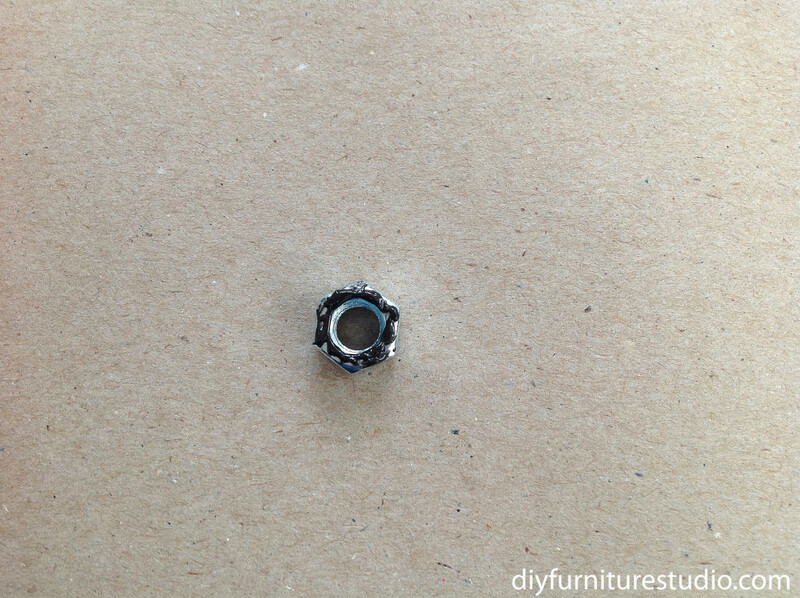 Below is a photo of the hanger bolt with the hex nut and washer screwed into place. 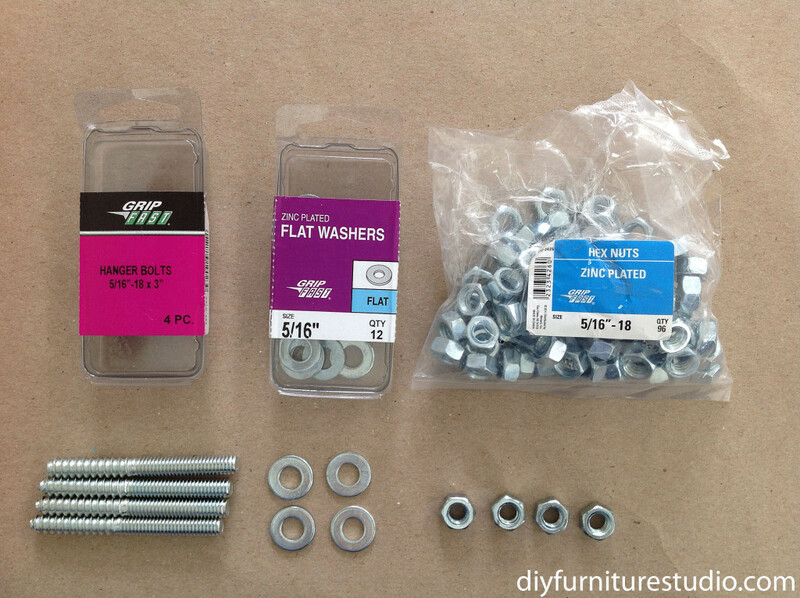 Next, I’ll describe how to glue the nuts and washers. 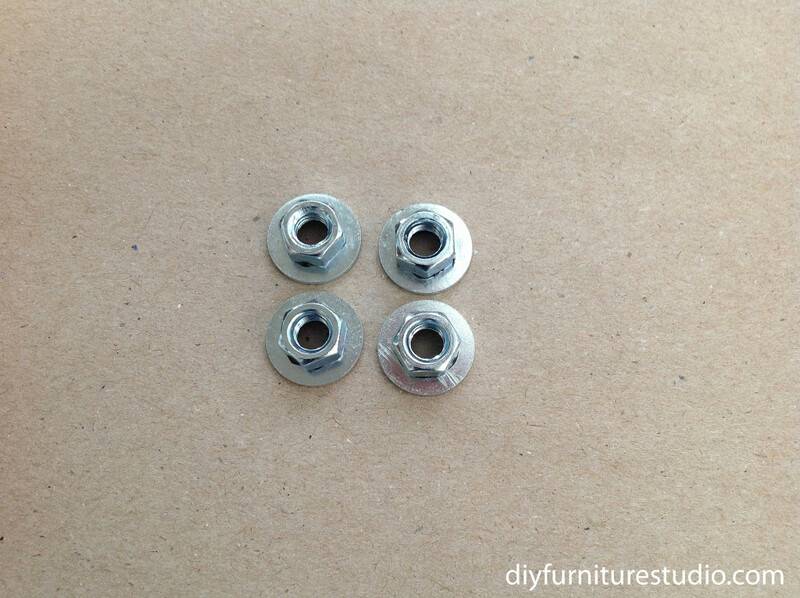 I glued together four sets of nuts and washers using J-B QuikWeld, a two part epoxy for metal. I started with roughly dime-sized equal parts of J-B QuikWeld, enough to do all four nut/washer sets. 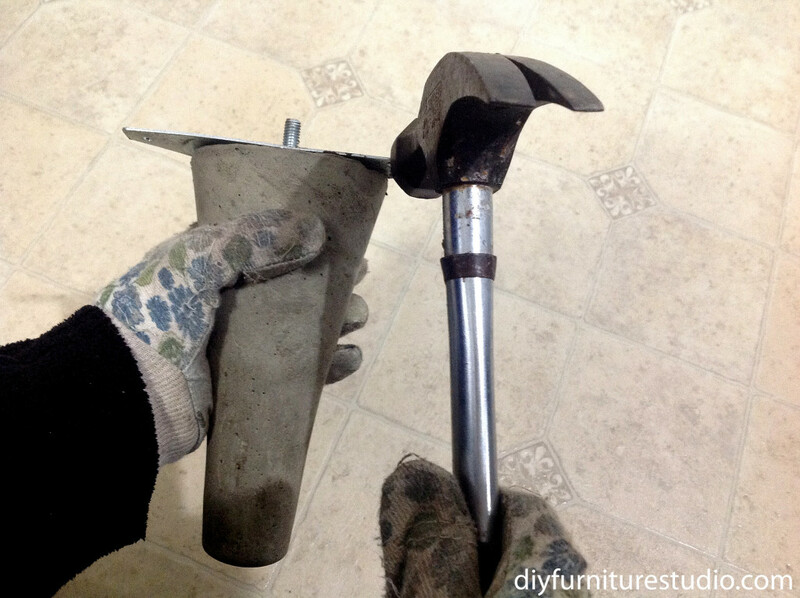 You will place mixed QuikWeld on one side of a nut as shown in the photo on the right below. 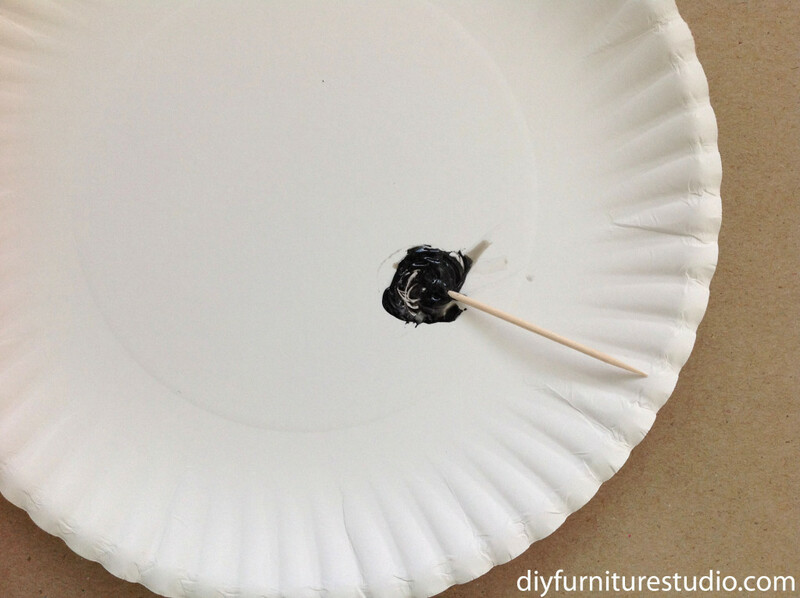 Then turn the nut over and set it down on the washer, centered over the hole in the washer. Be careful to not get glue on the threads of the nuts. Keep in mind that QuikWeld sets up in about 5 minutes, so get it done fairly quickly. Let the nuts/washers cure for at least half an hour. 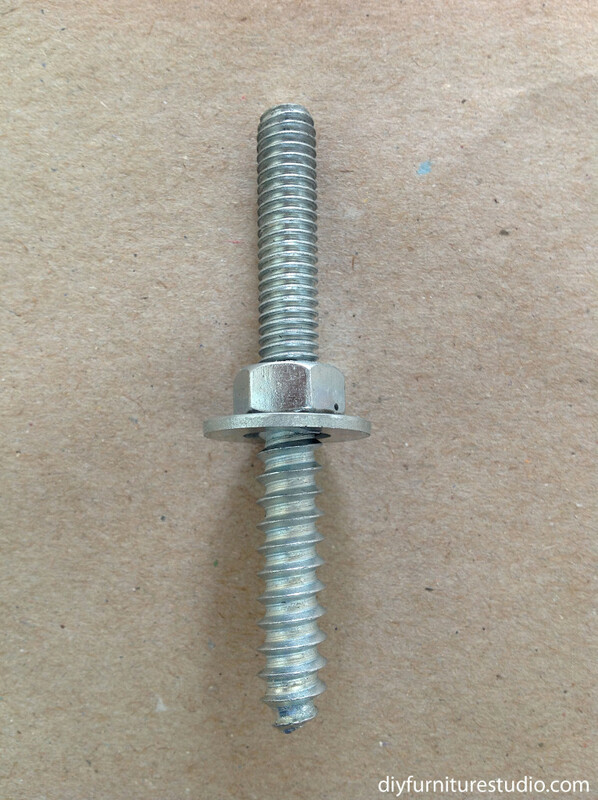 Then screw the nuts/washers onto the machine end of the hanger bolt. 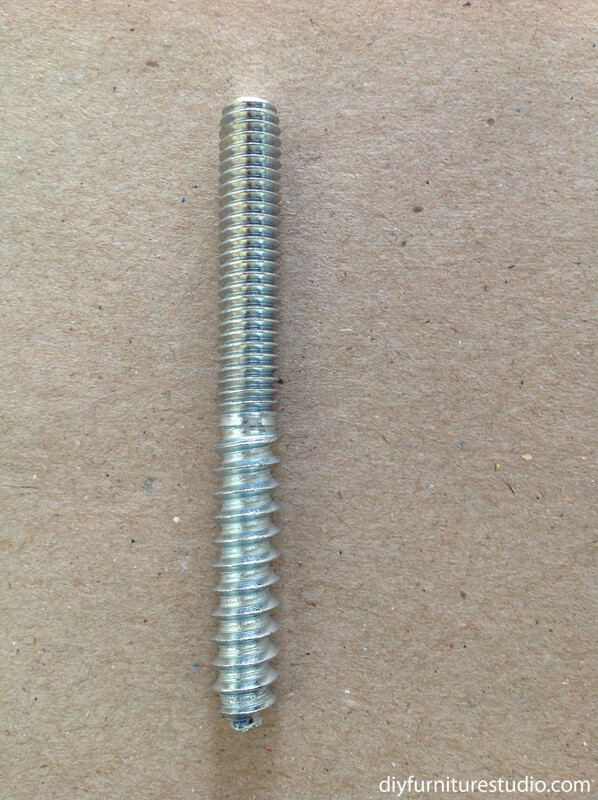 The machine end has threads that are closer together and has a flat end. 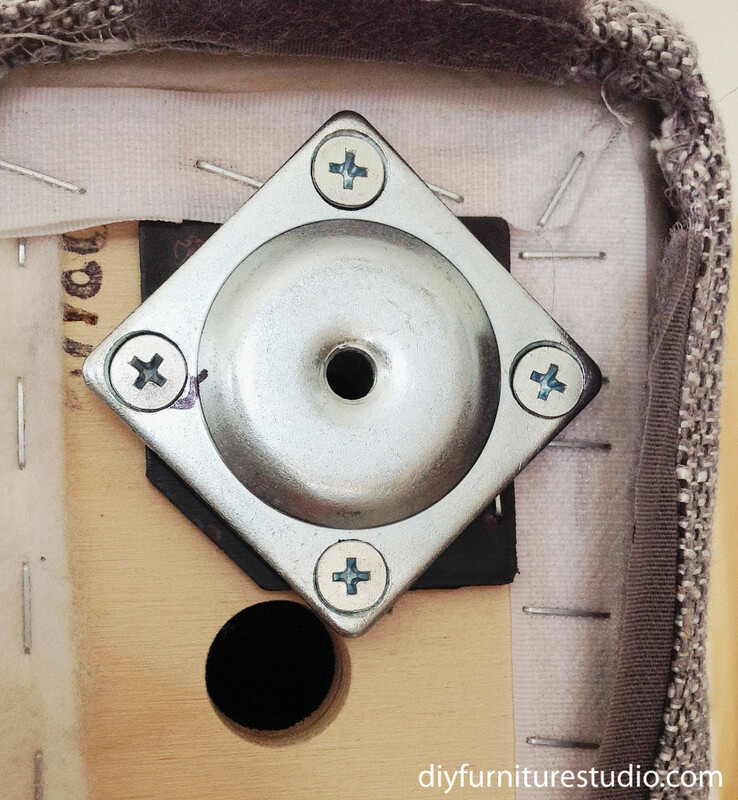 The nut won’t screw onto the other side because the screw threads are wrong, so I think you’ll be okay. 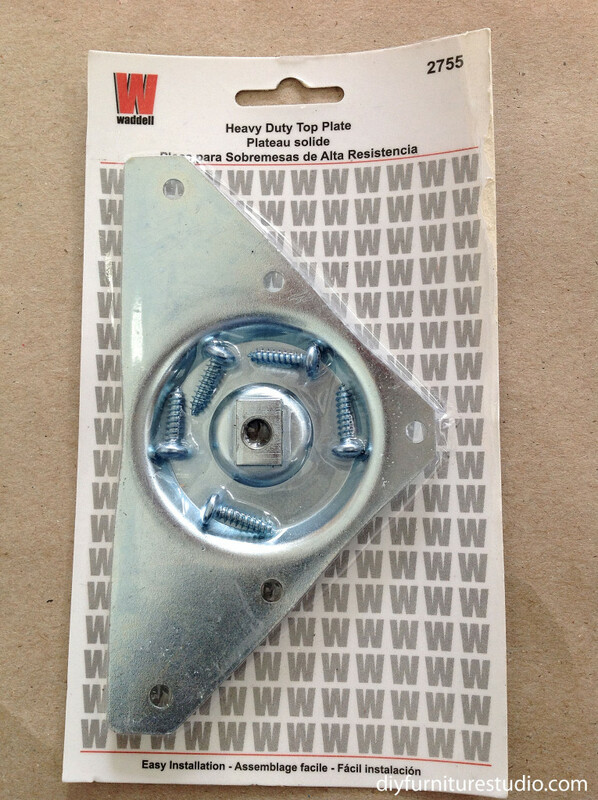 You will need one Waddell brand heavy duty top plate. The top plate is used to hold the hanger bolt in the right position in the mold during casting. This type of top plate is available at Menard’s, Home Depot, Lowes, etc. You are almost ready to start mixing cement! I sprayed the heavy duty top plate on both sides with cooking spray oil. 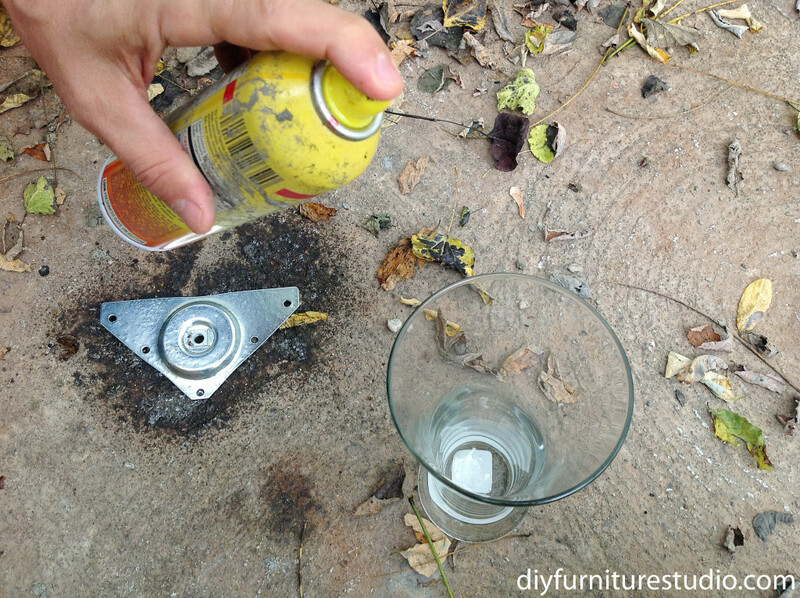 The cooking oil spray makes it easier to remove the top plate after casting. 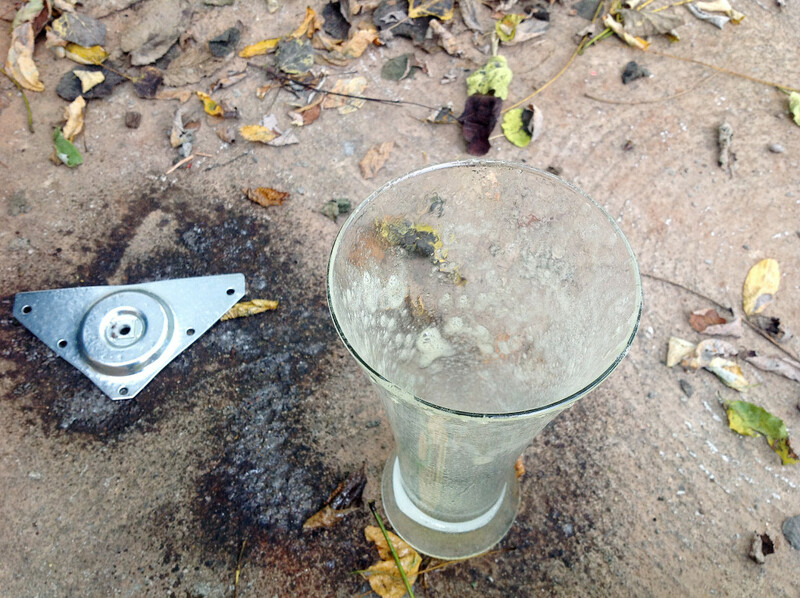 I also sprayed the inside of the glass mold with cooking oil spray. Next, put vaseline on the machine end of hanger bolt (flat end) and screw it into the bumped-out side of the heavy duty top plate. Screw it all the way in so that the nut is against the top plate. The vaseline protects the threads from cement and makes it easier to get the top plate off after casting. 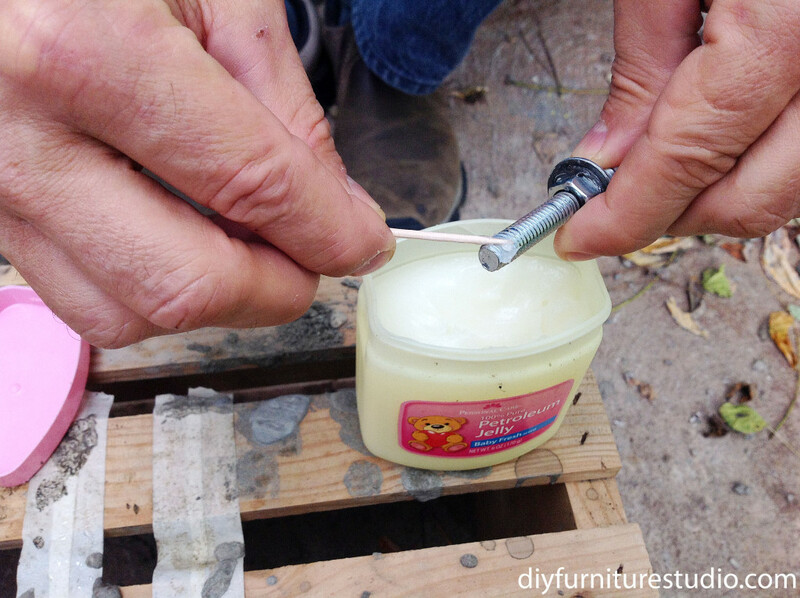 Don’t put vaseline on the other side of the hanger bolt. I cast one leg at a time because the Quikrete anchoring cement (or Cement All) sets up in about 5 minutes, which is enough time for making one leg, but not more. 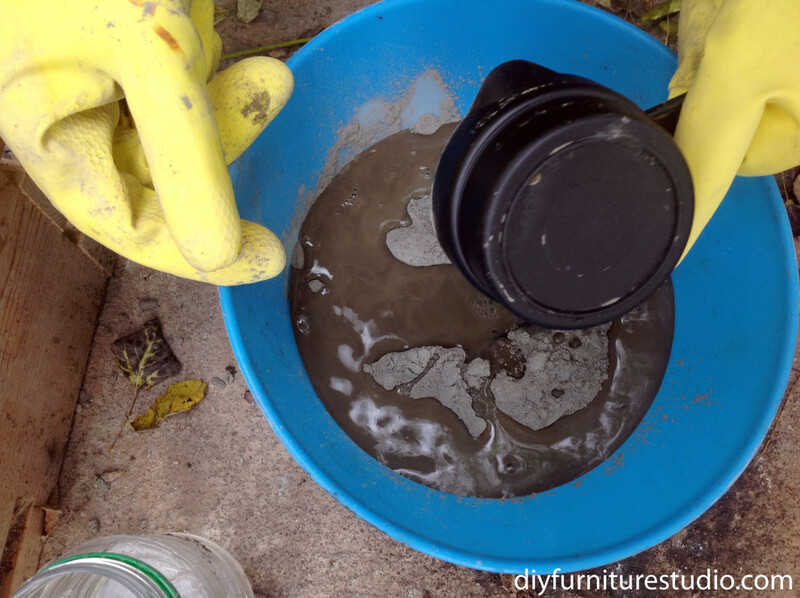 The amount of dry anchoring cement you will need is about two and a quarter volumes of your mold. 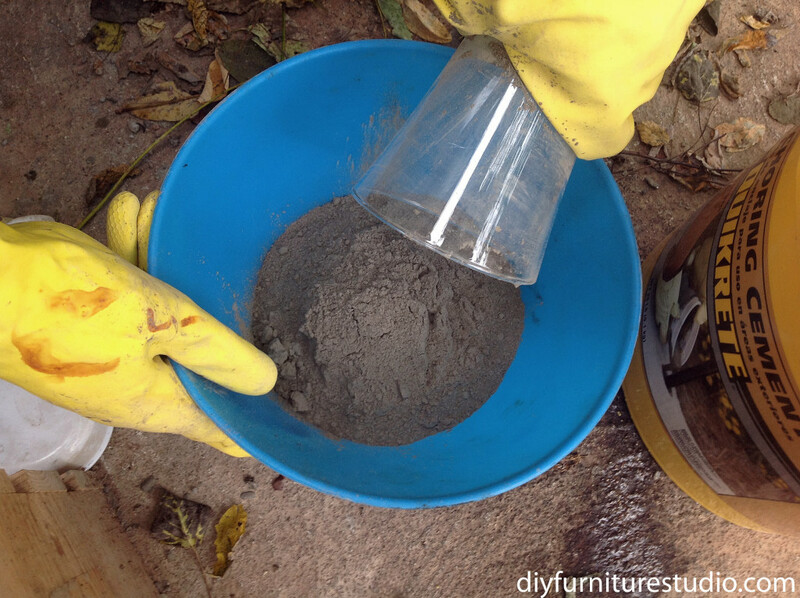 I know this seems like a ridiculous amount of cement, but the dry anchoring cement has air voids and it “shrinks” in volume after you add water. 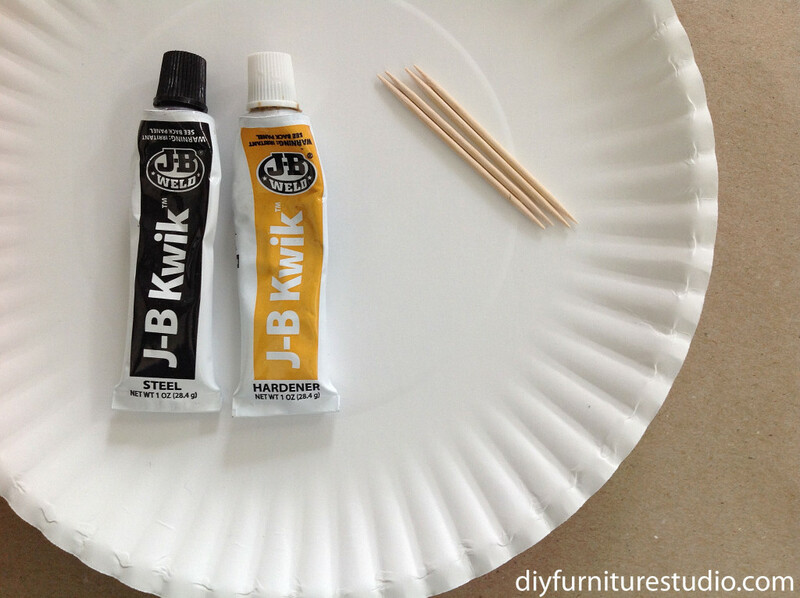 So, fill your mold to the top with anchoring cement, and put it in your mixing bowl. Do this again (which is the 2nd volume of the mold). Then fill your mold to about a quarter full and dump it in the mixing bowl. 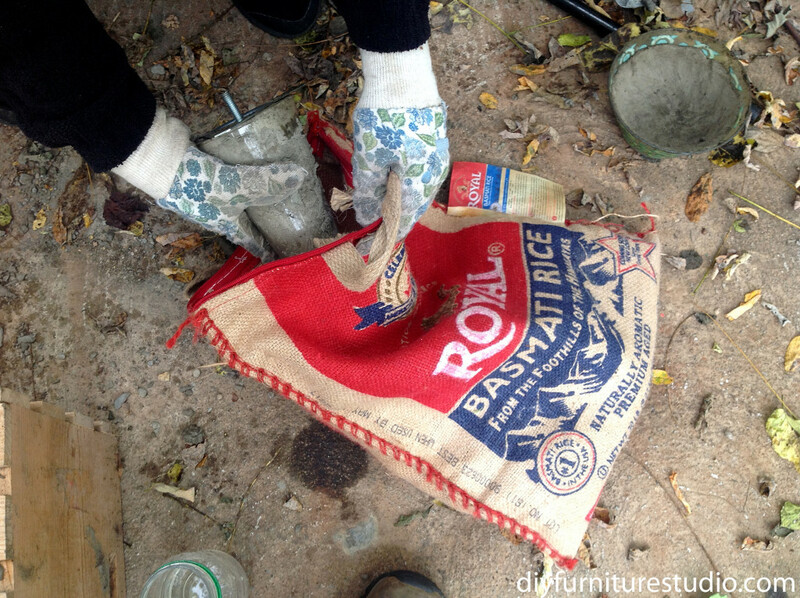 Now, what you have in your mixing bowl is the total volume of anchoring cement you need for one leg. How much is this, in oz? To determine the total volume (in oz) of the dry anchoring cement, you need to multiply the volume of the mold by how many volumes you used (which is 2 1⁄4, or 2.25). My glass mold was about 19 oz, so I multiplied this number by 2.25 (again because I used two and a quarter volumes of the anchoring cement). 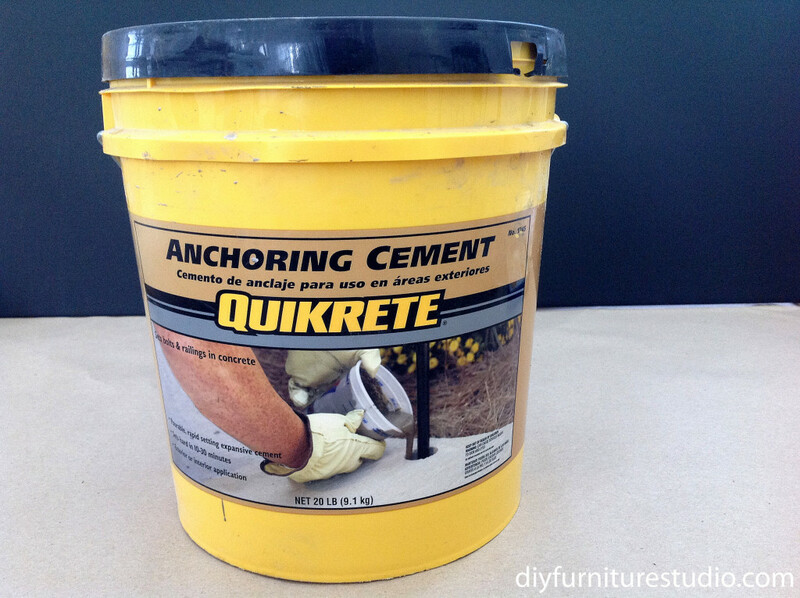 For my leg, this roughly equals about 40 oz of anchoring dry cement. (The calculation is as follows: 19 oz x 2.25 = 42.75 oz, but 40 oz is close enough). Remember that once you add water and start mixing you will have about 5 minutes before it sets, so read the instructions through and have everything ready to go before you add the water. I mixed with my gloved hands. 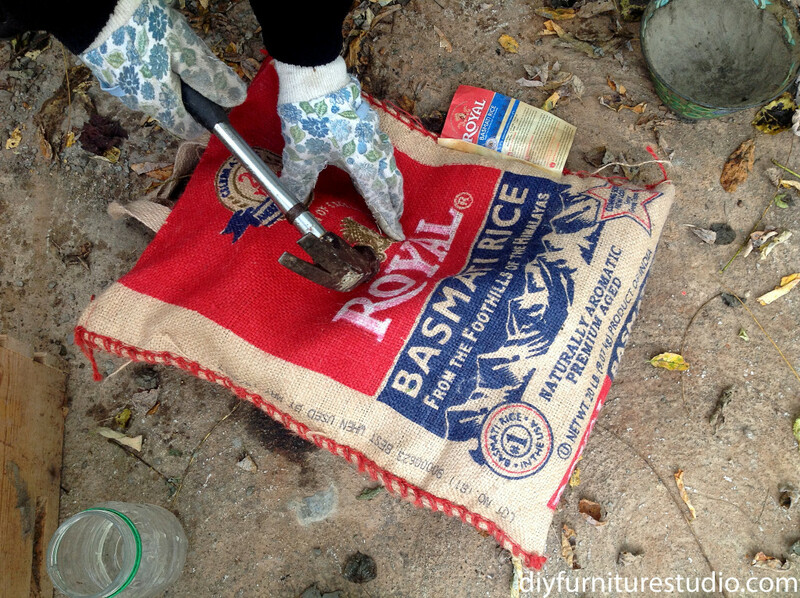 To adjust the consistency of the cement mix, you can add water or dry anchoring cement. 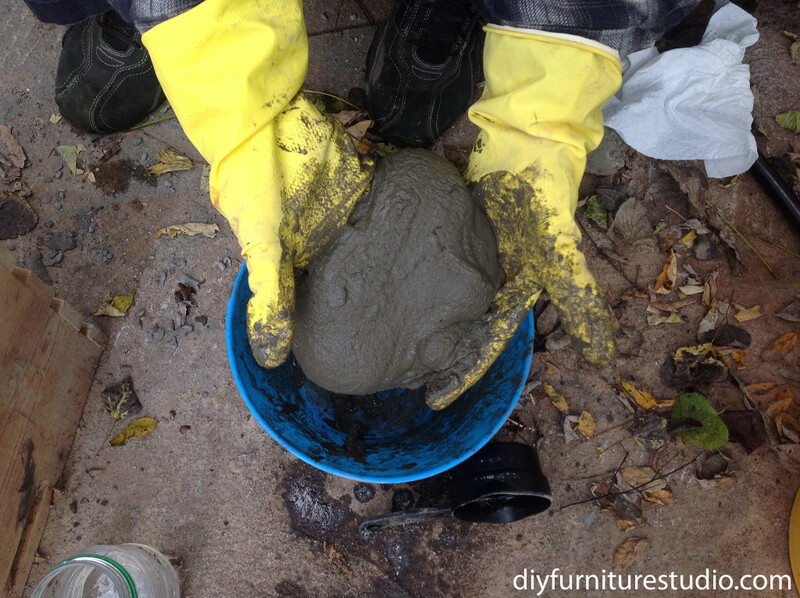 Remember, you want the cement to be the consistency of putty or slightly thinner, like a pourable pudding. The mixing should take a minute or so. Get it done as quickly as you can because your 5 minutes will be up soon enough. 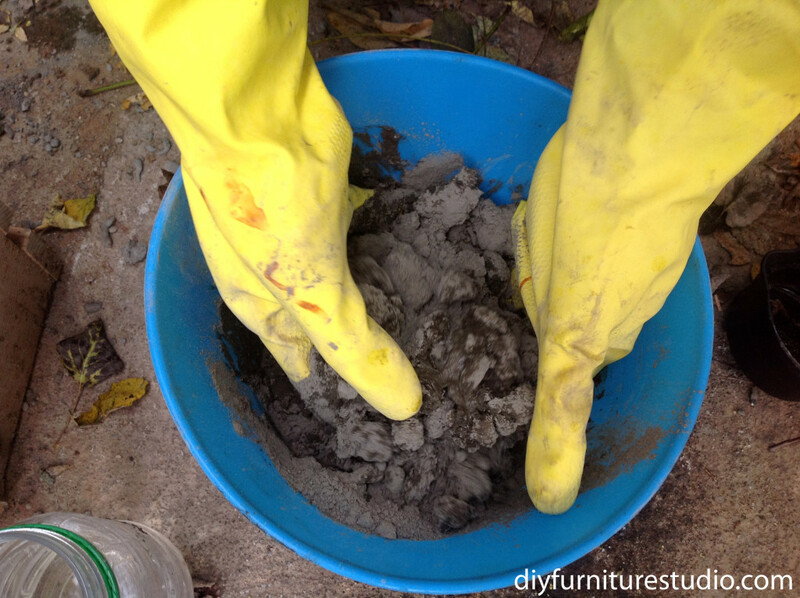 After mixing, fill the mold with cement. 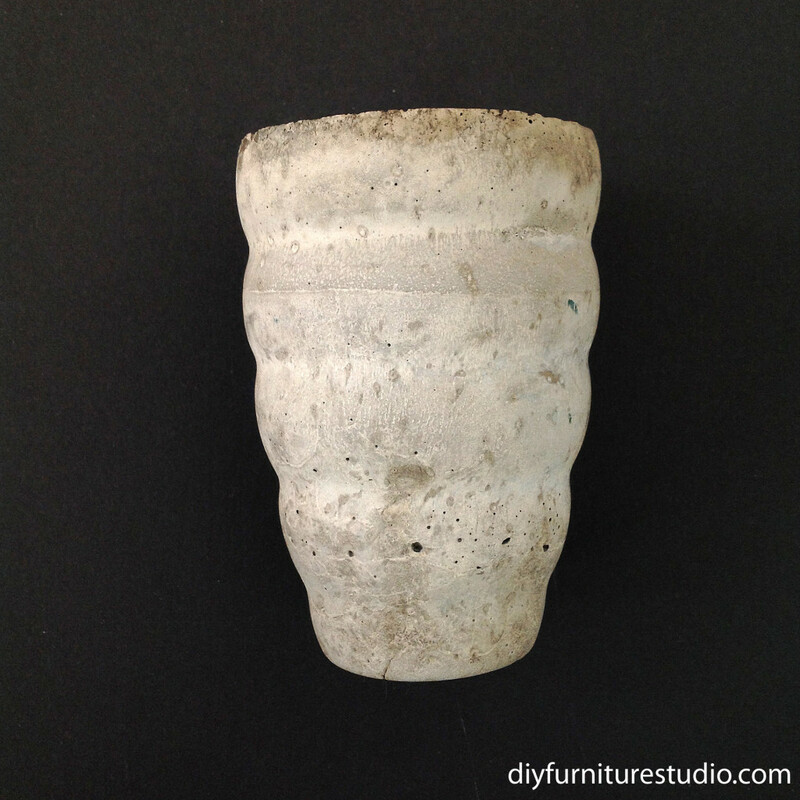 I used my hands and kind of plopped it in, tapping the mold lightly to minimize air pockets. Fill the mold almost full. I filled mine to about 1⁄4” from the top. 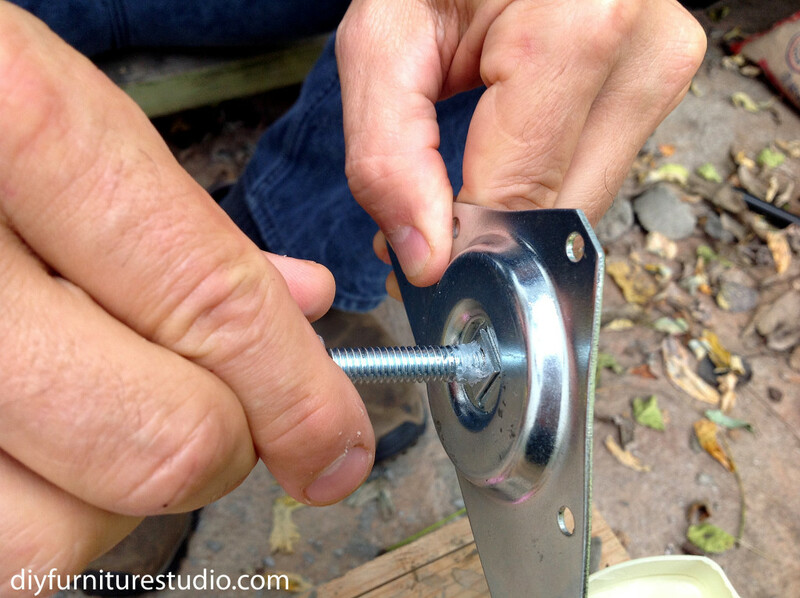 Now insert the pointed end (wood screw side) of the hanger bolt into the cement, eye-balling it in the center. Rest the top plate flat on the top edge of the mold. The next step is very important. With the top plate flat on the mold, rotate the top plate. 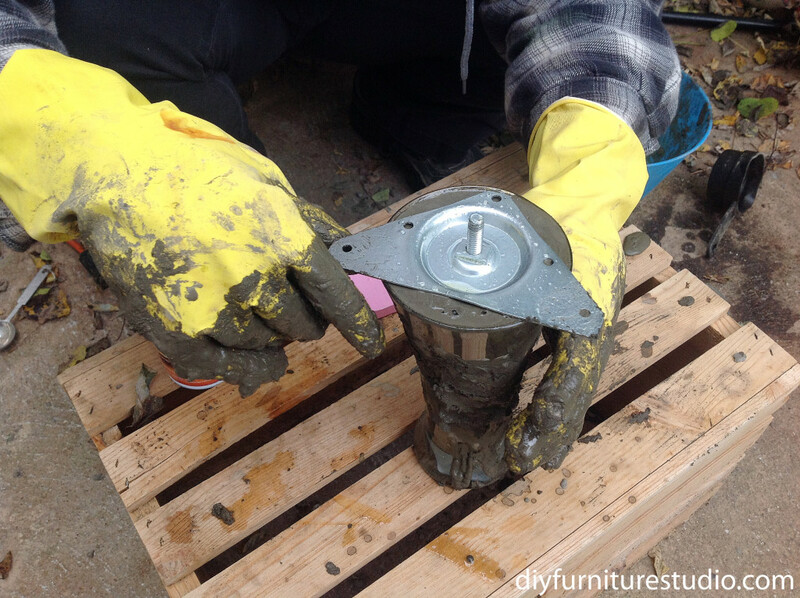 You don’t want the top plate to get cemented in place, which will happen if there is too much cement in the mold. If, when you rotate the top plate, you see cement being pushed up, you have too much cement. When this happened, I sort of dug a bit of cement out with my finger and then tapped the mold to level the cement again at the top. 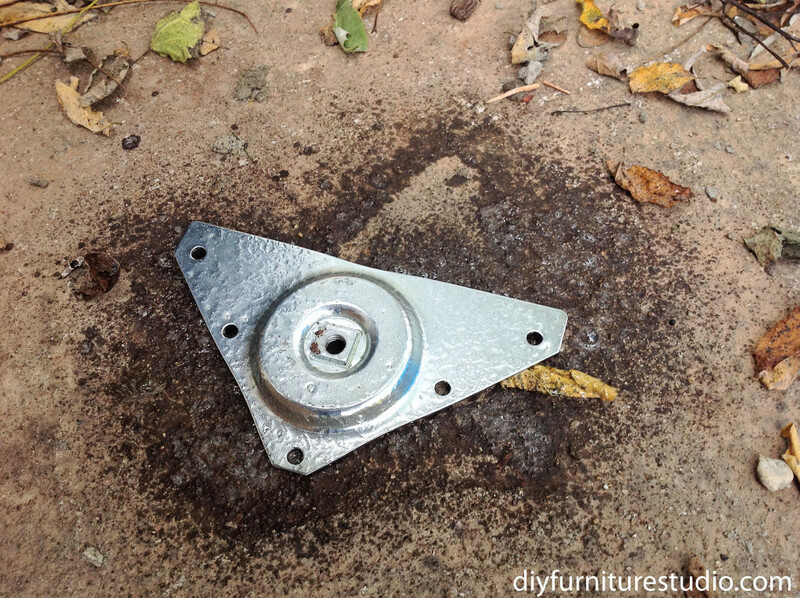 Get the hanger bolt re-centered if you had to move it to remove some cement. This whole thing goes quickly. It will set enough to remove the mold in about an hour, but I always give it several hours because it just seems right. As I mentioned before, I had to break the glass molds to liberate the legs. If you need to do this, be careful. 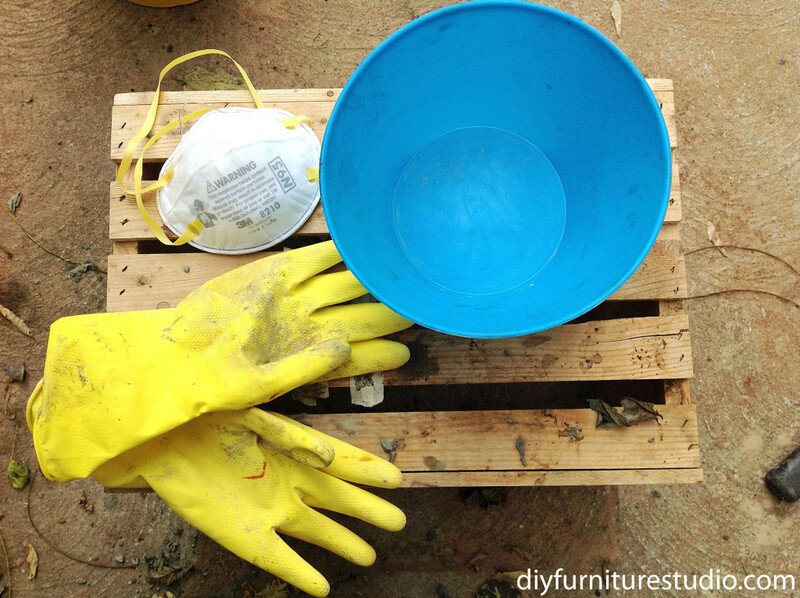 I suggest wearing gloves and safety glasses, and also breaking the glass inside cloth such as a rice bag or an old pillow case. 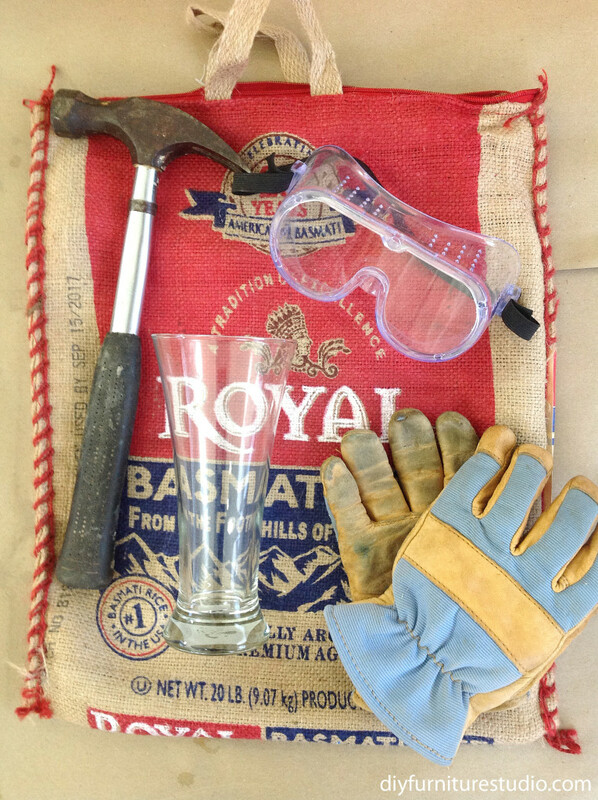 Clean up afterward so you aren’t leaving pieces of glass around to be stepped on or played with by children. To get the top plate off you may need to whack one side of it with a hammer to free it from the cement. I had to do this for all four of my legs. Some I had to manhandle, but they all came off. 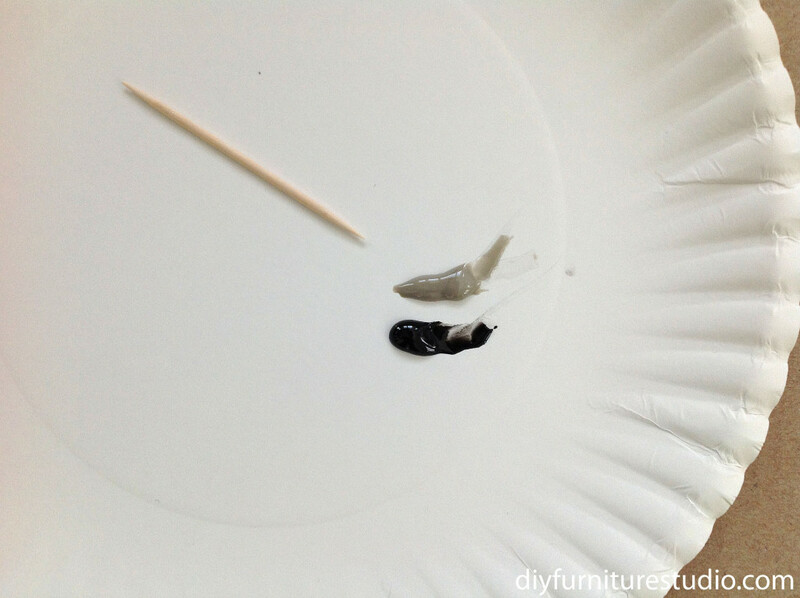 The cement takes about a month to cure completely and acquire its full strength, and in that time turns from a dark gray to medium gray color. I waited about a week to use my cement legs. 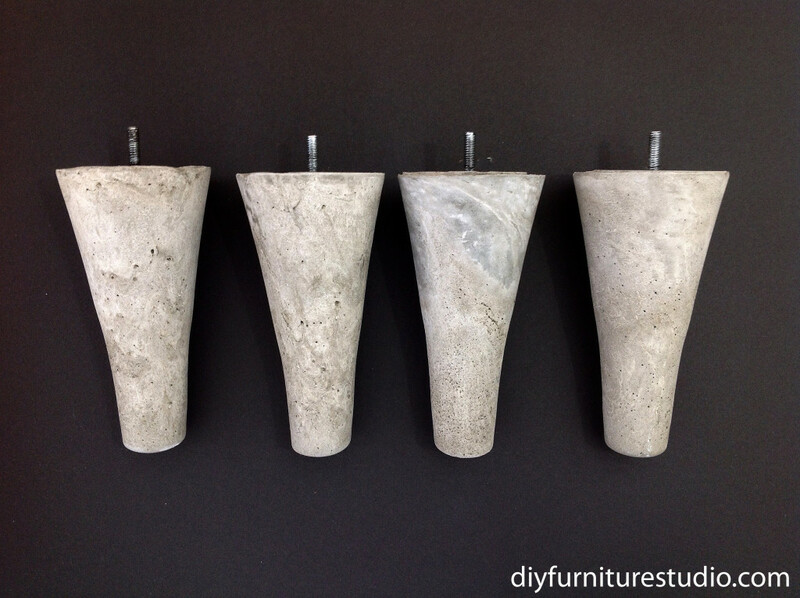 That’s it for the cement sofa leg! Aren’t they beautiful? They even have some areas that have a marbling effect, which is super pretty. Make enough for your sofa, commonly four. Then make some for your friends because they’ll like them, too. 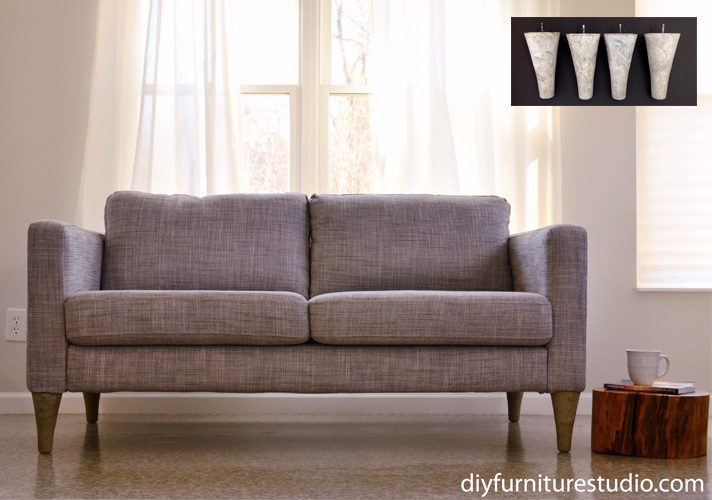 I’ll show you how I installed the cement sofa legs on my IKEA Karlstad sofa and also a generic brand sofa (non-IKEA, non-European). Your sofa may have a different landscape which I haven’t covered. If you read through my two examples, I think you will be able to hatch a plan for your situation. Feel free to e-mail me if you have something different and can’t figure out a way to install them. 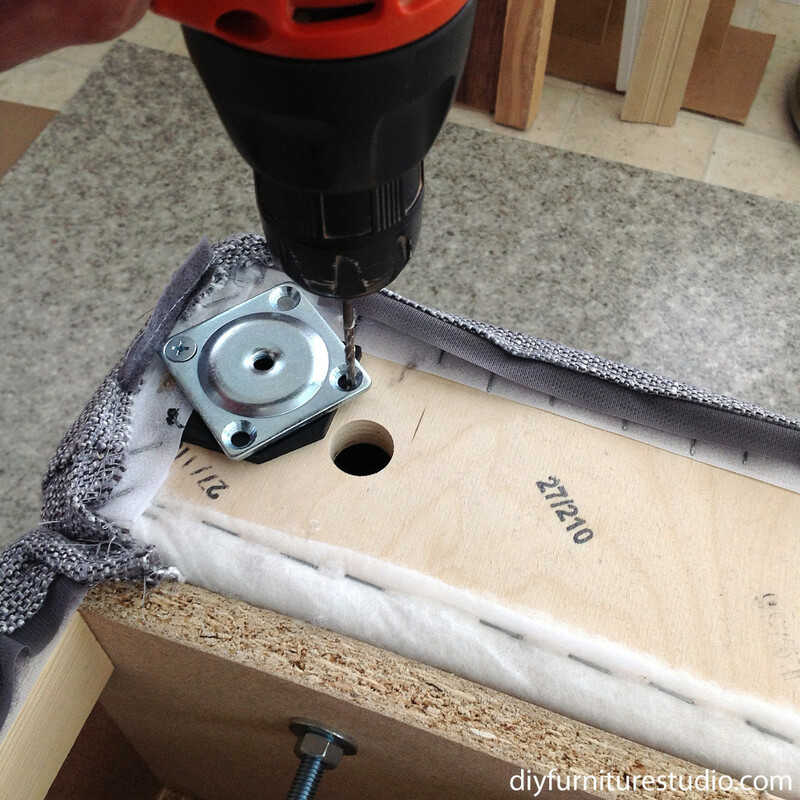 My general safety advice is this: don’t drill any holes that will compromise the sofa frame. Second, and more importantly, is that the M8 threaded insert on the IKEA Karlstad was not in the right location for my cement sofa legs. 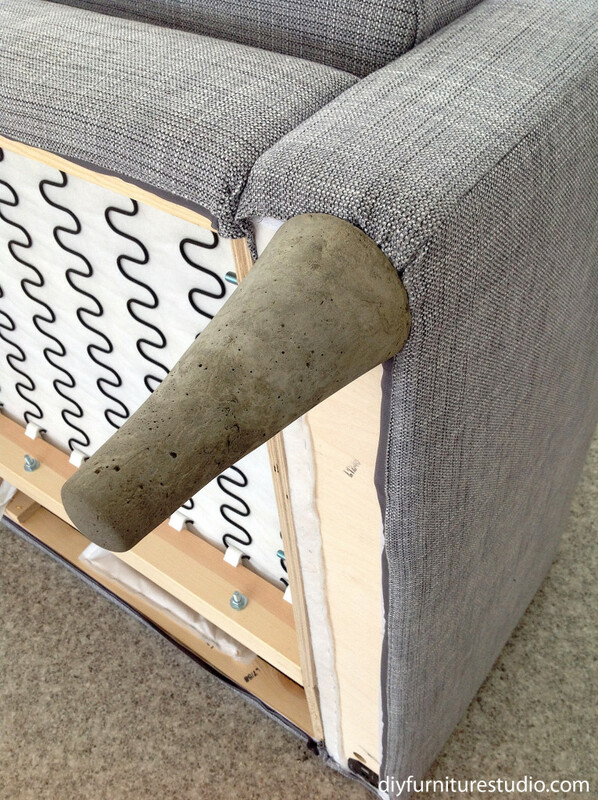 The threaded insert on the Karlstad sofa was too close to the edge for my cement legs. The reason for this is my legs are about twice as wide (at the top) as the legs that came with the sofa. Therefore, even if I had cast metric hanger bolts in the cement legs and screwed them in the metric threaded insert that came with the sofa, the legs would stick out past the edge of the sofa, looking wonky, and not in a good way. So I bought different mounting plates, which I installed in the right location for the top width of my cement legs. 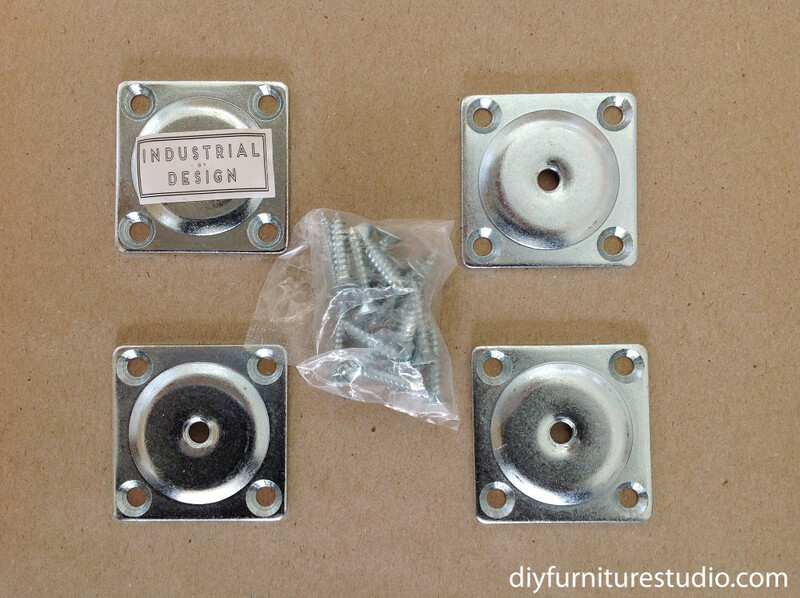 They are Industrial Strength Leg Attachment Plates (set of 4) sold by Industrial by Design. I ordered them here from Amazon. These mounting plates are a standard size, 2 inches square. To figure out where to put the mounting plate, I suggest screwing the mounting plate just a little way onto the end of a bolt of a leg. Then hold it up to the underside of the sofa, and reposition the leg until it looks good. Note the approximate location of the mounting plate. 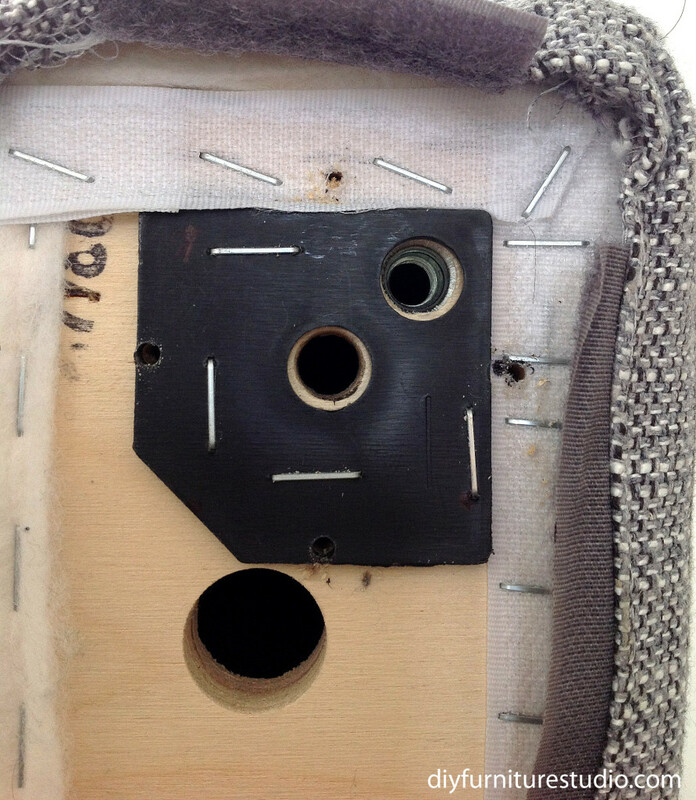 You may need to reposition slightly, like I did (see below), depending on staples, holes, etc. in the way. I took the legs that came with the Karlstad sofa off and decided to mount the center of the new mounting plates over existing holes in the frame. In the photo below (left), the hole on the top right is the old M8 threaded insert, and the hole in the center is where I positioned the center of the new mounting plate. I rotated the mounting plates so that when I drilled holes for the screws I wasn’t drilling into staples or too close to other holes. It worked out. If I had to, I would have pulled out a staple that was in the way, but I didn’t have to. 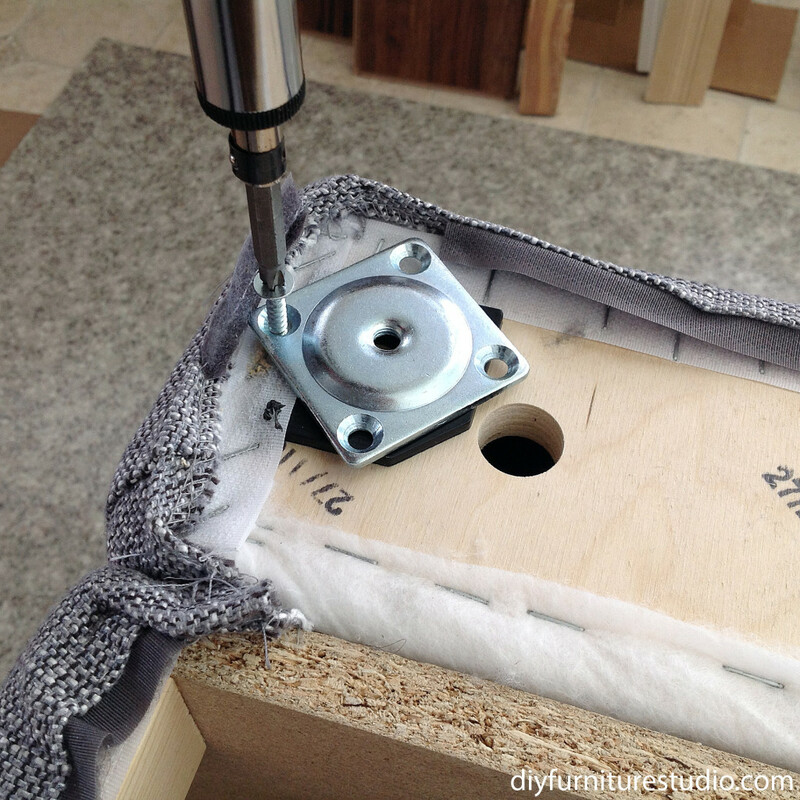 Position the mounting plate as described above and drill the first screw pilot hole. 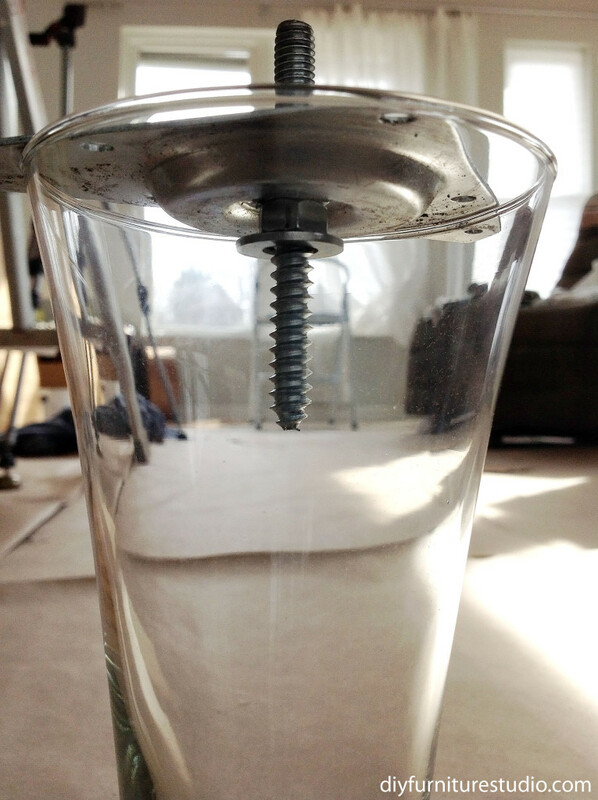 The put in the first screw. 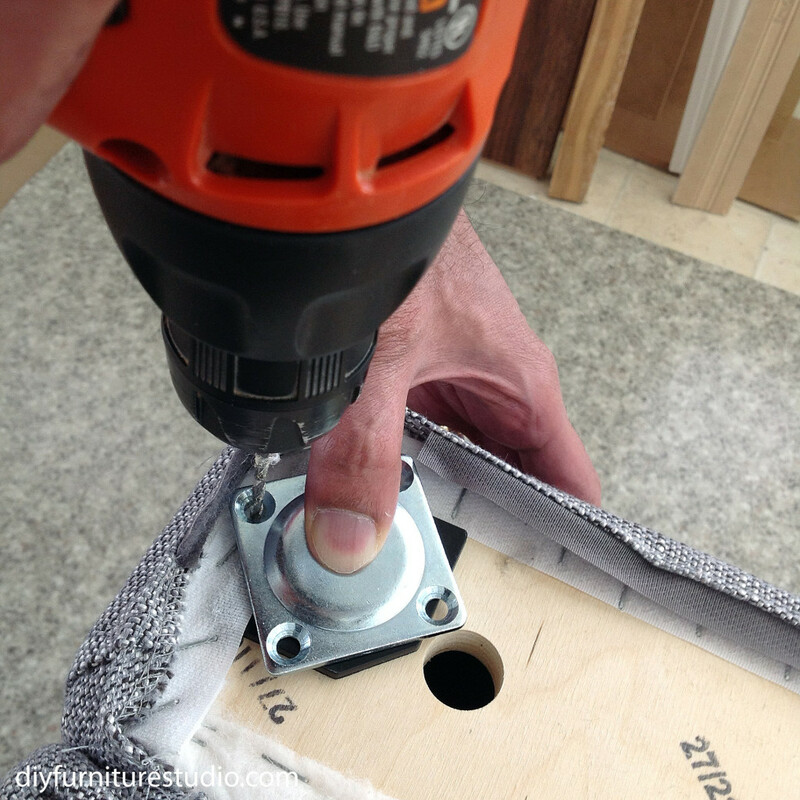 Drill the second pilot hole and the second screw. Do the same for the third and fourth screws. 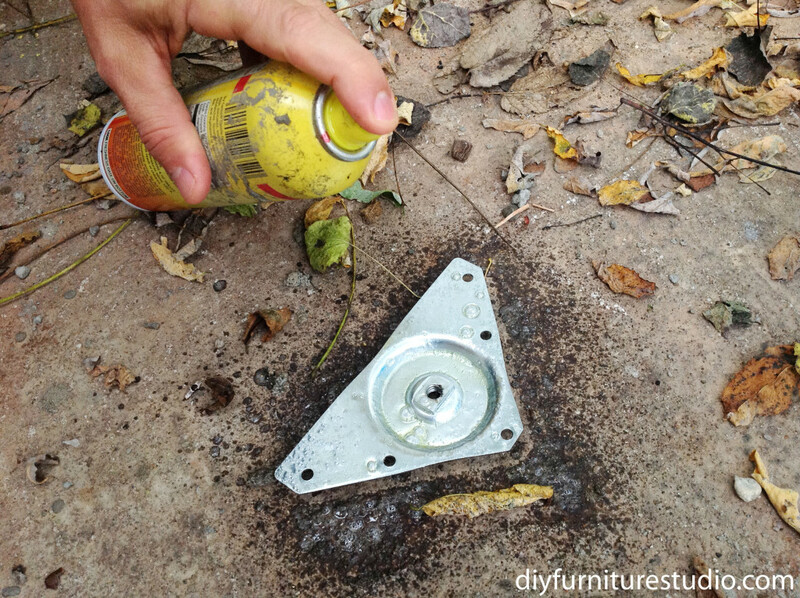 Install all four of the mounting plates, then screw on your new cement legs. Done! Enjoy! 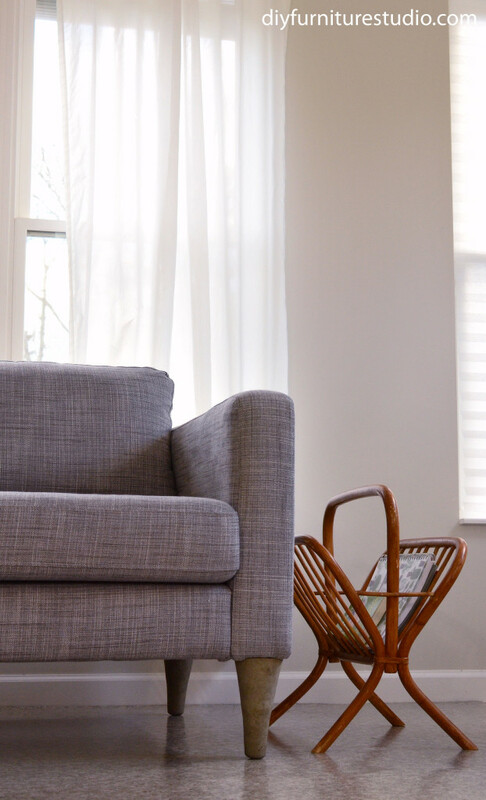 We have had our generic sofa for many years, and although I really like the sofa, it could benefit from some refreshing, which is in progress. So, I’m not going to show you the whole sofa now because it needs more work. You will be so happy if you find yourself in my situation with this sofa. 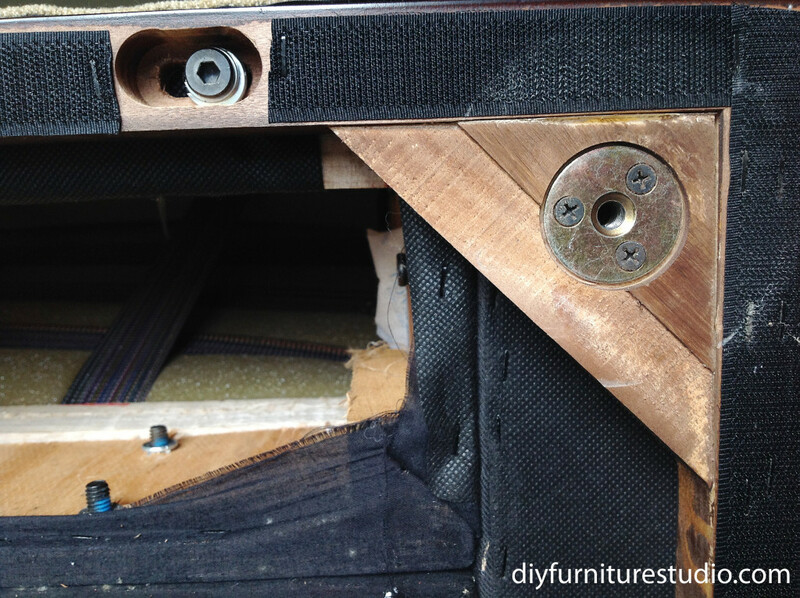 The existing threaded insert (or mounting hardware) on the sofa was the right thread for my 5/16″ SAE bolts and in the right locations, so I just removed the old legs and screwed the new ones in. If the threaded inserts are not compatible or are in the wrong locations, follow instructions above for installing new mounting plates. 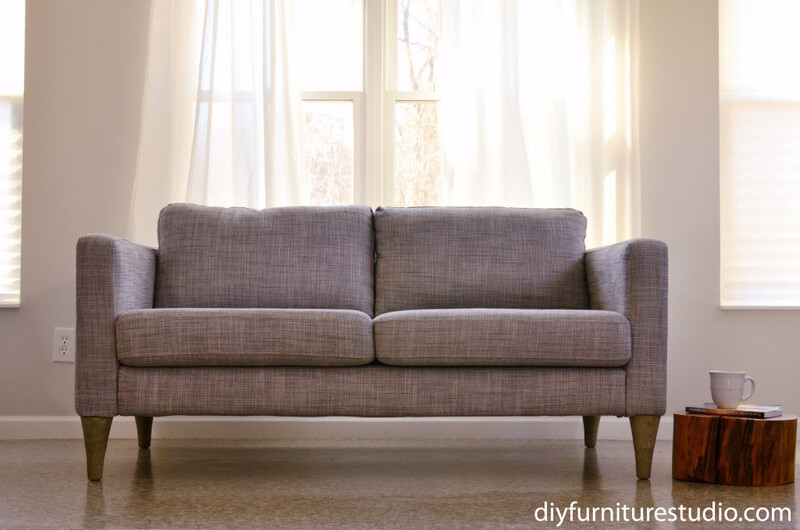 I’ll have a few blog posts coming up on refurbishing this sofa, including fixing broken sofa springs and refreshing it with a DIY slipcover or new upholstery. 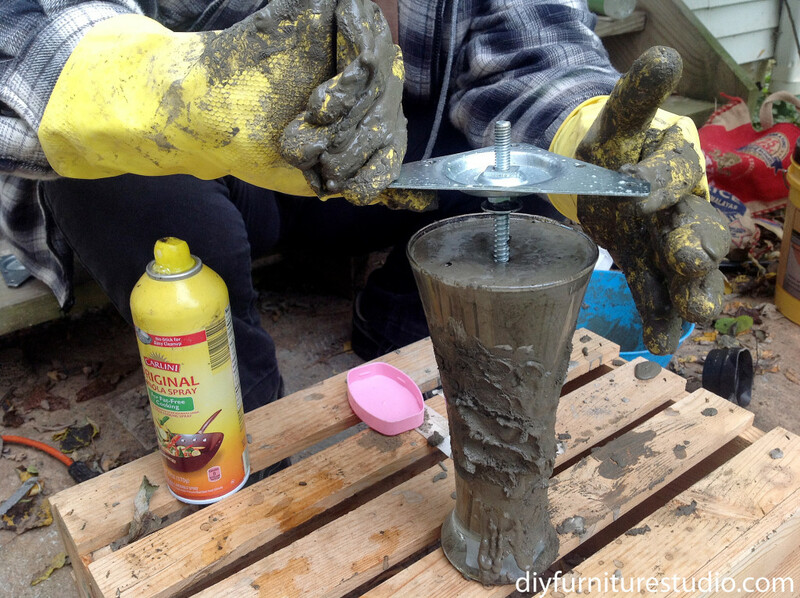 I decided to add a section to share ideas of some ideas of things to explore with cement legs. I’ll update this section with any ideas from you and anything else I try. One thing, of course, is to change the shape of the mold. 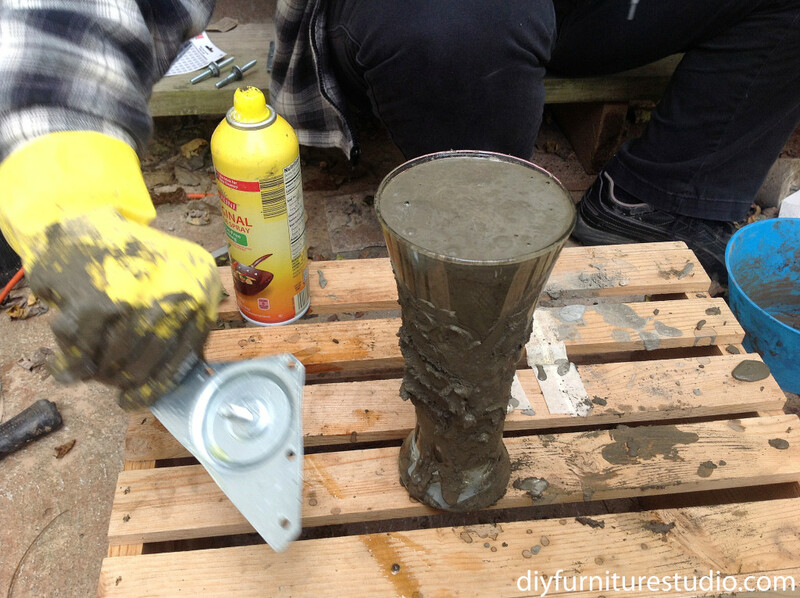 As an example, here is another cement leg I made, using a glass from IKEA as the mold. 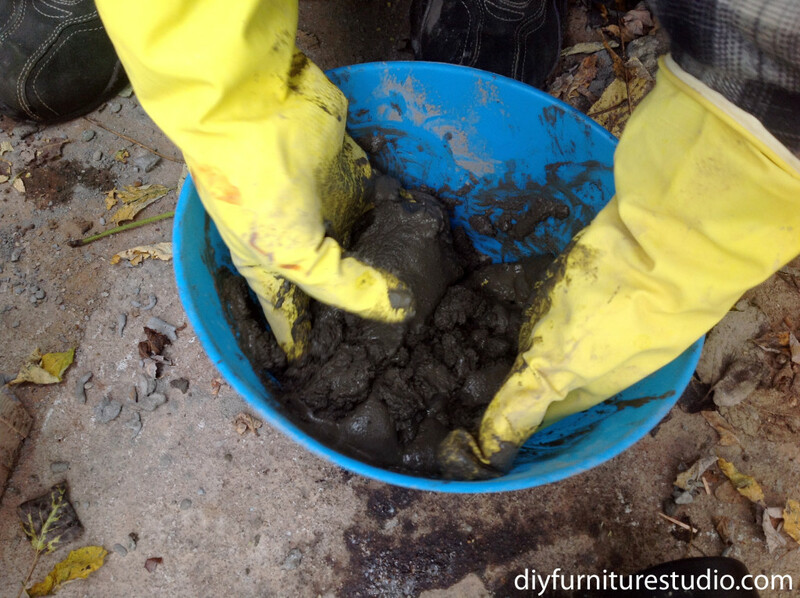 I would also like to try coloring the cement, either by adding colorant to the wet mix or staining the cured sofa legs. I would think one could really have fun with cement additives and polishing, using techniques similar to finishing a concrete countertop. I think I might also try waxing cement legs and buff to make them shiny. I’m so glad you joined me in this project. Until next time…. This is such a cool idea! love it and I can’t wait to make some. I love working with cement. Thanks so much Diane! I’m sure you’ll enjoy your homemade legs!